It’s been said that you could fly to Spain bringing virtually nothing, and then start your Camino de Santiago from any one of the popular starting points, buying everything you need along the way. While this may be true, there are a few things you may want to be prepared for in advance. Below are my most essential tips after hiking the Camino del Norte-Primitivo-Frances-Fisterra routes in just under three weeks. Don’t bother to buy paper maps; bring a smartphone instead. The smartphone also acts as a lightweight substitute for many other things, including camera, music player, alarm clock, flashlight, etc. Use gronze.com for maps of the “official” caminos and lodging. The site lists lodging (e.g., albergues or pilgrim hostels, hotels and pensions) and prices, when available, for each town you pass through, and allows you book (via booking.com) super easily on the go. When you book through this site, the site owner presumably earns a commission, which helps compensate for all the hard work put into creating this valuable resource. Alternative to the tip above: use caminodesantiago.consumer.es. The downside to this site is the maps, at least the time of my camino, were not available on the mobile version of the site so I kept having to visit the desktop site, which was not optimized for a small screen. It also does not allow you to book lodging through the site. Both gronze.com and caminodesantiago.consumer.es are in Spanish, but you don’t really need to understand the language to understand the maps and to book lodging. If you need to translate the sites, use Google Translate. Be sure to download offline maps of Spain on Google Maps onto your smartphone before you go. This way, even if you don’t have a cell signal, you can use your smartphone as a navigation device. 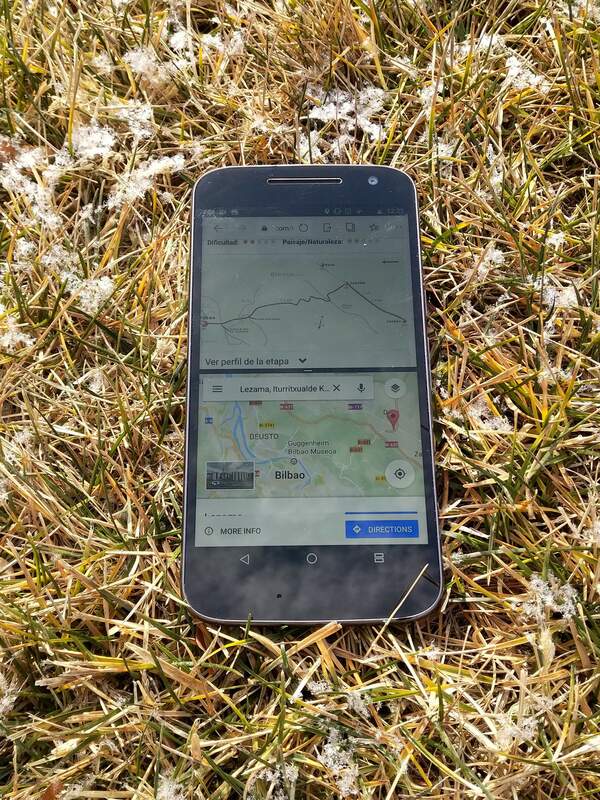 Even without a cell signal, the phone uses its GPS chip to tell you where you are. If you are using Android version 7.0 (Nougat) or higher, and you are not using the Camino de Santiago Companion app because you are doing a camino other than the Camino Francés, use split-screen mode to juxtapose the gronze.com maps with Google Maps. Many pensions (which are like private bed and breakfasts, but often without breakfast) require you to call the owner upon arrival. So it helps to have cell phone access. Instead of roaming using my existing U.S. SIM card, I bought a cheap pre-paid local SIM from a Vodafone store upon arriving in Spain that, for only 10 euros, gave me 1.2 GB of data and 15 free phone calls. I could add additional data to the SIM card by paying, say, 10 more euro in the Vodafone app. Most albergues take cash only. Same goes with the smaller stores. The best way (and currency exchange rate) to obtain euros is to withdraw cash from an ATM using a debit card. You don’t need to reserve lodging days in advance, or even at all, if you are not hiking a popular route during the peak time, which is generally August. But sometimes I would reserve a pension a couple hours in advance just to make sure it was available when I got there. Bring earplugs if you intend to stay in albergues because of the snorers! In albergues, if you intend to wake up and leave early, pack up all your stuff the night before you depart, so you do not wake everyone else up trying to pack when you leave.